If you want a mobile phone that would meet your demands as a music lover, then the latest product from Motorola is just right for you. The Motorola MotoRoKR EM30 is not just a sleek mobile phone but a cool music player at the same time. The latest technology from Motorola called ModeShift allows the users to determine which phone feature they are currently using. The keyboard will illuminate with different colors depending on the feature. If your phone is red, this means that you are using the music features of the MotoRoKR EM30. On the other hand, if you are using the phone features of the MotoRoKR EM30, whether you are texting or calling, the keyboard will illuminate in color blue. 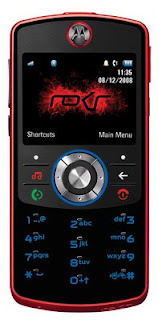 A pretty cool phone and would probably be cheaper than the ROKR E8.